You’ve been told for years that you need to get there. That there’s nothing like it. That it’s an experience you’ll never forget. The mystery. The history. My goodness, the beauty. Any traveler worth their salt wants to get there, period. After years of dreaming, months of planning, and days of hiking, you finally turn the corner and see it. Machu Picchu. While on Machu Picchu tours with Global Basecamps, you’ll most likely have a professional guide accompanying you, giving you a complete history lesson on the methods of construction, life of its inhabitants, and theories about its purpose. But there is so much hype about the place, can the experience really be condensed into a four-hour tour? Of course, there is much, much more to see. Near the north end of the city of Machu Picchu, there stands a gate leading to a hike up Huayna Picchu. Walking onto this trail requires a second ticket that is not included with your Machu Picchu entrance fee, so when planning Machu Picchu hiking tours, make sure to plan ahead and ask your travel specialist to include this ticket in your itinerary! Only 400 people are allowed onto this trail daily, in two intervals of 200 at 7am and 10am, so planning ahead is key. Machu Picchu means “Old Mountain” in the Quechua language, and Huayna Picchu is its young pair. Most well known for being in the background of most tourists’ photos of the famous site, Huayna Picchu is actually one of the more satisfying day hikes in the region. A tough, sometimes perilous trek (beware to hikers afraid of heights!) leads to the best view of Machu Picchu, and a hidden second set of ruins high above what most tourists see. The hike takes about 1.5 hours to reach the peak, so allow yourself about 2-3 hours in total to reach it, enjoy the view, and climb back down. 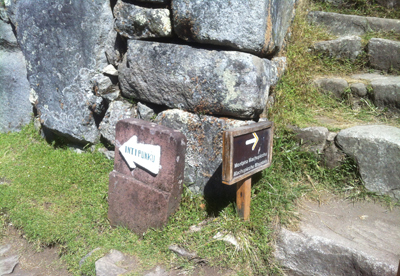 On the hike to Huayna Picchu, there is a fork in the trail leading in two directions. The right path is most traveled, and leads to the ruins atop the mountain. The left path is a heart-pounding climb to a set of fascinating caves. The steps leading here are steep enough to resemble a ladder, and are wide enough to allow one person to climb them at a time. The caves themselves are stunning. Ranging in size and purpose, these caves are thought to hold a militarily strategic purpose as well as a religious one. For travelers looking to get away from the crowds around Machu Picchu, this is a must-see. Machu Picchu Mountain completes the saddle that is created on one end by Huayna Picchu, with the Machu Picchu ruins in the middle. Whereas Huayna Picchu is completely sold out of its 400 permits every day, Machu Picchu Mountain requires no permit, and is far less traveled. Don’t let the lack of hikers fool you, the views from this mountain (twice as high above the ruins as Huayna Picchu) are incomparable. The path to reach the top of the mountain is about 1.2 miles long - about the same length as Huayna Picchu’s path, but takes about twice as long to hike thanks to the steep elevation gain. Allow yourself about 90 minutes to reach the top, and a total of three hours to get there, enjoy the view, and climb back down. 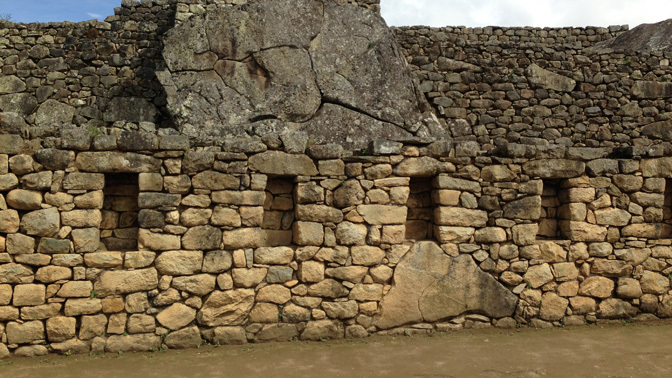 Inti Punku, the Sun Gate, is most well known as the “entrance” to the city of Machu Picchu. Trekkers completing their four-day Inca Trail first see Machu Picchu from here, but for those travelers not hiking the Inca Trail, the 1.5 hour round-trip climb to this site is still completely worth the time. This is an easier hike for travelers uncomfortable with heights, and offers magnificent views of the Vilcambamba or Urubamba River. No additional permit is required to reach this site, so if you feel like a hike, go for it! If you’re looking for something completely different, this is the hike for you. 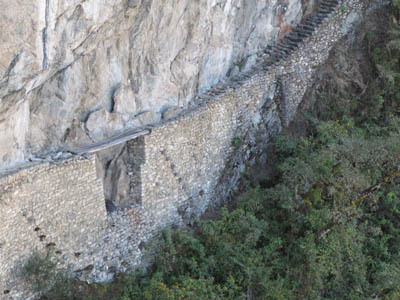 The Inca Bridge is exactly what it sounds like, an Inca stone construction connecting two paths on a steep cliff. The paths leading to the bridge feature no safety rails, though they are more than wide enough to walk comfortably on. However, hikers are still required to sign in at the head of the trail for safety’s sake. The hike takes approximately two hours round-trip, and lacks the elevation climb of most other treks in the area. The reward is a “backdoor” view on Machu Picchu that few ever see, and views of surrounding mountains and rivers that are difficult to not appreciate.